Amazing Spider-Man tie-in toy gives us our best look yet at the Lizard! We've seen plenty of Andrew Garfield as the rebooted Peter Parker and Emma Stone as Gwen Stacy, but we still know next to nothing about the villainous Lizard. That why it pays to keep an eye on those tie-in toys. 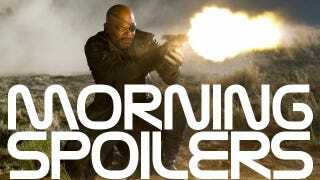 Plus Clark Gregg reveals more about Agent Coulson's expanded role in The Avengers! Producer Andrew Kosove reveals exactly when we'll know what's really going on with Ridley Scott's Blade Runner follow-up. Simon Pegg wonders whether he's too old to play Wee Hughie in Adam McKay's The Boys. Plus lots more on the futures of Chuck, Once Upon a Time, and The Secret Circle! "I had to pinch myself because I'm not that jaded. I got to show up and put on the Coulson suit and I've got enough lines that I have a trailer, plus I get to do this amazing script by Joss Whedon. I don't know how I got to be a part of it, I just feel very lucky about it. When you look at the team it's made out of rock stars, divas, and giant muscles with superpowers so somebody has the job backstage at Lollapalooza to make them all play in the same concert and super band — and that's what Agent Coulson does." "The thing about The Avengers that I think is clear from the trailers is that they've spent a lifetime preparing for a moment like this. Whatever is coming down the pike, everyone is taking care of business to the best of their abilities. It may cause some tensions but they're going to hit it head on." "It's a little hard to believe, coming from a supporting role that they kept beefing up and adding to new movies, that I would actually walk into that room I walked into and see that collection of people in their various versions or incredibly worked up neoprene. When I walked in the first thing I did was go, "Oh my god! Look at all these actors in costumes!" But then you look at them a little closer and you go, "I just walked into a room with Captain America, Tony Stark...oh my god!" And then you go, "That's Jeremy Renner and Robert Downey Jr!" Then all of a sudden Sam [Jackson] comes in and gives me a look and I'm like, "There's some big problems we've got to take care of so let's go do it!" Is this concept art of The Lizard from The Amazing Spider-Man? "Here's the thing about Ridley. Ridley is a special guy. He's a force of nature. He's got a lot of stuff that he's working on. I believe it's an extremely high priority for Ridley, that's what he's said to me. This project is moving forward aggressively in development." "Sometime in the first two months of the new year we'll announce who the screenwriter will be and whether or not it's a prequel or sequel. And then we'll be off to the races." "I have [read the script], it's really good. I'd love to do it, if it came about. My fear is that I'm too old to play Wee Hughie, now. But you know, obviously, the character was drawn, at least, around my face." In December 2011 a strange futuristic-looking artifact was uncovered in an uncharted Mayan temple in Mexico - examination of the artifact revealed binary coded information which appeared to be encoded footage. The content was unlocked by students at Chicago state university and appeared to be several hours of video footage heralding the end of the world... time stamped in the near future. Here's the promo for episode nine, "Chuck vs. the Kept Man", which airs next Friday. "They wanted to shoot some footage of skydivers landing on the beach. We were perfectly setup for what they needed. It all came together very quickly." Here's a promo for next Sunday's midseason premiere and eighth episode overall, "Desperate Souls." "He certainly seems to be a happy guy at first glances. They wrote him as a happy-go-lucky guy. [He doesn't] desire anything. But at one point he says, ‘I have a prosperous kingdom, a beautiful daughter, and a lovely Queen,' and I decided to make the Queen line not as excited as the other two items on that list. In other words, he's unhappy and I don't think people are ignorant [to that] … So there's a little bit of darkness underneath him." "The actors all seem to think I'm coming back, but that's a discussion I've have not had with anyone else. But they all say, ‘You have to come back because you explain this and that' and ‘You're the reason that… ‘ But, really, they're all guessing along with [viewers]." Here's a new promo for the anime adaptation of Marvel's greatest vampire hunting badass, starring Harold Perrineau as the voice of Blade. The show premieres Friday, January 13 on G4.